Are you considering orthodontia to straighten your teeth? There are several varieties of braces on the market today, such as Invisalign clear braces, available from Hammond Aesthetic and General Dentistry in Provo. The current menu of orthodontic treatments requires a whole new glossary. Clear braces look a lot like an athlete’s mouth guard. Over many months, the patient wears a series of different clear braces that gradually bring their bite into proper alignment. People love them not only because they’re almost undetectable. They also come out at meal time and when you brush your teeth. Lingual braces are sometimes described as ‘braces behind the teeth.’ They can be just as effective at realigning adult teeth as the traditional ‘metal and wires’ kind but are almost completely hidden. Many adults and teens who straighten their teeth choose this type of orthodontia. Once a patient has completed treatment, retainers must be worn regularly to keep the beautiful straight teeth in their corrected position. There are several types of retainers available. The time-tested Hawley retainer consists of a metal wire that surrounds the teeth and keeps them from shifting. The metal wire is attached to a molded acrylic form that fits snugly in the upper mouth (palate) or lower mouth. Clear retainers are newer on the orthodontic scene. They cover the teeth like a see-through glove and do not need metal bows or clasps. Some orthodontic patients prefer clear retainers. At Hammond Aesthetic and General Dentistry in Provo, we provide clear braces from Invisalign. We also offer a range of cosmetic dentistry services that upgrade your smile. Make an appointment with us today. At Hammond Aesthetic & General Dentistry in Provo, we focus on three important things as we strive to be your dental provider of choice. We want to be the dental practice families trust in for quality care, whether for routine preventative services, tooth restoration, or cosmetic dentistry. If your son chips a tooth and is in extreme pain, we want to be the first choice that comes to mind. We offer variety for any family’s various dental needs. Hammond Aesthetic & General Dentistry focuses on your Family. When we sit down in consultation and you say “Dr. Chris Hammond, I need to know the cost of veneers, dental implants, the cost of a dental bridge… I need to know my options.” We’ll give you the bottom line on cosmetic dentistry, family dentistry, and dental implants. Whether it’s affordable dental care for quality of life or affordable cosmetic dentistry for increased confidence, we’re here. 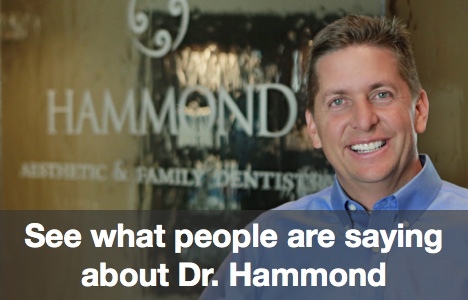 Hammond Aesthetic & General Dentistry focuses on the Facts. 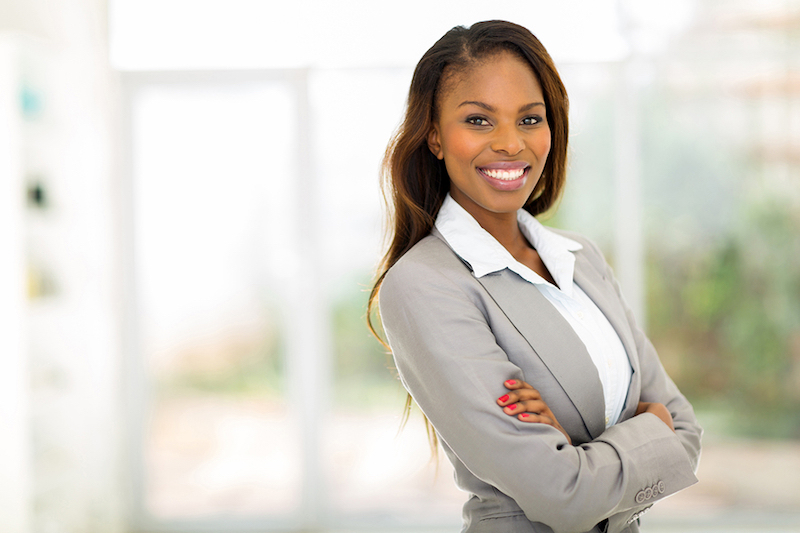 We focus on clean, bright, and inviting and follow rigorous standards of sterilization. Our team here at Hammond Aesthetic & General Dentistry is friendly, professional, and considerate. Hammond Aesthetic & General Dentistry focuses on a Friendly atmosphere. Schedule your next appointment with Hammond Aesthetic & General Dentistry in Provo today. Kids Who Like Dental Visits? At Hammond Aesthetic & General Dentistry in Provo, we are proud of the fact that the majority of our young patients like visiting our office for their checkups, cleanings, and treatments. We believe that establishing a relationship with an experienced, friendly dentist is a vital responsibility for parents. Optimal physical health for children is impossible without the oral health component. Though this fact seems obvious, dental caries in children is a national epidemic, and, for the most part, is preventable. Regular checkups are just as critical as well child exams and immunizations. The health of your child’s teeth and gums influences their speech development, eating habits, academic success, mental health, and social relationships. At Hammond Aesthetic & General Dentistry, we love working with you and your child to establish habits that ensure a healthy smile for life. Today’s children are far less fearful of the dentist than their grandparents’ generation. Part of the reason is that today’s dental tools have advanced significantly and rarely cause any pain. If you are old enough to remember the whining dental drills of fifty years ago, you probably have a greater appreciation for the technological discoveries that make dental treatment far more pleasant than in years past. But advanced tools are not the only reason that our youngest patients look forward to dental visits. At Hammond Aesthetic & General Dentistry, there is a friendly atmosphere that puts patients of all ages at ease. If you are looking for a top dentist for your child, rest assured that our caring team will make your child feel comfortable during their dental visit. 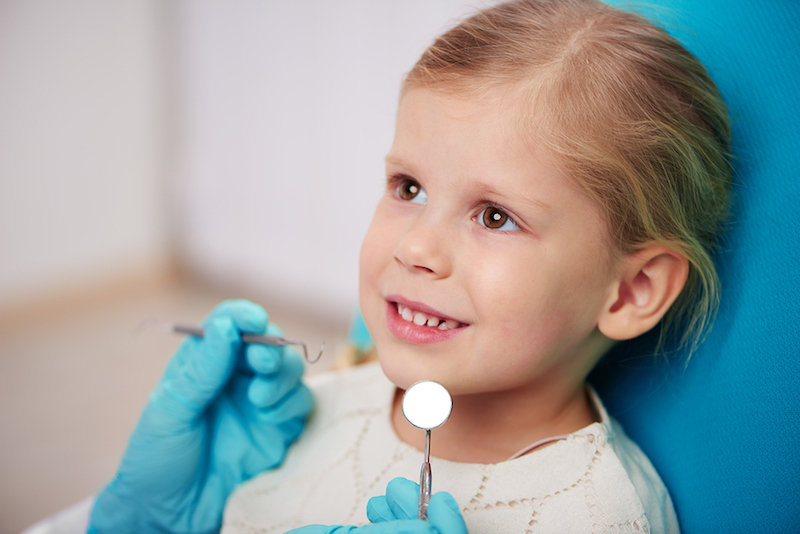 When Should A Child Have Their First Dental Checkup? We counsel parents to bring their toddler in for a first exam before age one, or when their first tooth erupts. During the initial visit, we can review dental treatments such as sealants, fluoride treatments, brushing and flossing techniques, and orthodontics. We also give moms and dads guidance about thumb-sucking, pacifiers, and other habits that affect dental health. At Hammond Aesthetic & General Dentistry in Provo, we specialize in porcelain veneers and clear braces from Invisalign. Schedule an appointment with us today! 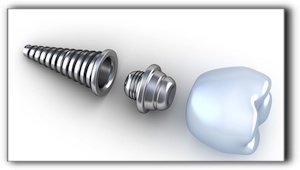 Looking into how much dental implants cost and getting a straight answer can be frustrating. But there is a reason for that. It can be confusing to research the cost of getting a dental implant and finding nothing solid. Let us take a moment to explain why most dental sites don’t publish the cost. The number of teeth being replaced may be more than the number of implants needed to cover that section of the mouth. Tooth implant dentists want to offer accurate pricing rather than scare you away with higher estimates. It takes a simple consultation to review dental history, assess needs and establish a treatment plan. This could mean a more efficient surgery with fewer implants. Dental implants are the state of the art in tooth replacement, much better than a bridge or denture. But sometimes the technique won’t be what you thought it was going to be, or maybe you aren’t a good candidate for the treatment. A ballpark number might be possible to post on the internet but the changing cost of supplies and lab fees make it impossible to guarantee an accurate price for full mouth dental implants. Dentists who offer implants can accurately calculate dental implant surgery rates based on current prices when you come in for a consultation. Please make an appointment to quickly and accurately get these answers. Call Hammond Aesthetic & General Dentistry in Provo for more specifics. We also provide Invisalign clear braces, and sedation dentistry for those coping with dental anxiety. Malocclusion is dental-speak for crooked teeth. In many cases, crooked teeth can be straightened with clear braces that are so subtle, some call them invisible. An overbite takes place when the upper front teeth come down too far over the lower teeth when the mouth is closed. An underbite is the reverse condition—the upper front teeth close farther back than the lower front teeth. An open bite refers to a bite in which the upper don’t overlap the lower teeth. This can be present on the whole bite or just one side. Tooth rotation is one of the most prevalent kinds of malocclusion. Rotated teeth appear as if they are twisting out of place. Tooth rotation can create the illusion of uneven coloring because of the way light reflects off the face of teeth. When the upper and lower palate are offset to the point where the upper teeth close onto the wrong side of the lower teeth, it is termed a cross bite. In some rare cases – called transposition – teeth erupt in spots where other teeth should be. For example, a canine (pointed tooth) comes in where an incisor (front biting tooth) should be. Can you imagine trying to chew if your teeth have been playing musical chairs? If you or your child has crooked teeth or a misaligned bite, we invite you to schedule a thorough examination promptly. 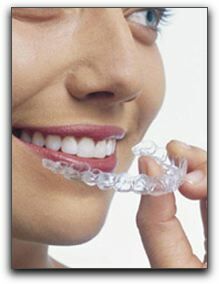 You may be a candidate for clear braces from Invisalign, available from Hammond Aesthetic & General Dentistry in Provo. We also provide family dentistry. Schedule an appointment today. At Hammond Aesthetic & General Dentistry in Provo, we use the latest proven dental technology to bring our patients general and cosmetic dentistry. In addition, we’re up to date on the latest dental research that drives the industry forward. A new type of filling created from bioactive glass has been shown to prolong the life of fillings, by inhibiting secondary decay and replacing lost minerals. Stem cell regenerative medicine is poised to provide a host of exciting breakthroughs in dentistry. A research team from the University of Nottingham and Harvard University is applying stem cell technology to dentistry with the development of stem-cell based biomaterials that regenerate tooth dentin. The goal is to use them in fillings and root canals to save and regenerate tooth structure. The research is in its early stages, but this technology could one day help preserve millions of smiles for men and women worldwide. 3D printing is already being used in some dental offices to manufacture aligners, retainers, drilling guides for implant placement, and extremely accurate models for restorations. As the printers become faster and less pricey, you will be seeing them in more Utah dental offices. 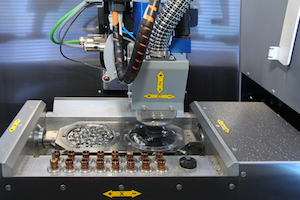 Note: The image with this blog post is a Computer-Aided Design and Computer-Aided Manufacturing machine used for the production of dental restorations. At Hammond Aesthetic & General Dentistry in Provo, we offer our patients three innovative procedures for smile redesigns. Dental implants are transforming the face of dentistry. For most patients, a dental implant is the ideal solution for a missing tooth. A dental implant is a metal (usually titanium) post implanted into the jaw bone to replace the missing root of a tooth that has been extracted. The crown and supporting structure are securely attached to the post. What makes implants such an attractive option is that after the final crown is affixed, it is virtually indistinguishable from a natural tooth. Clear braces, sometimes called invisible braces, allow you to straighten your teeth discreetly because it is nearly impossible to see them while they are being worn. There are a couple of different kinds of invisible braces. At Hammond Aesthetic & General Dentistry, we offer Invisalign clear braces. Teeth have a way of getting yellow and dull, and may be that way even after a cleaning by a dental hygienist. If you’ve thought about getting a dazzling, movie star smile, Zoom! teeth whitening may be for you. Zoom! treatments penetrate the enamel of your teeth and bleach away discolorations caused by the food and drink we consumer. Best of all, it’s an in-office treatment that can be done in a single visit. Hammond Aesthetic & General Dentistry would love to help your achieve your dream smile. We have been providing excellent dental care in Provo since 1967. We look forward to meeting you. Call us today for an appointment. Now is a great time to have crooked teeth! Why? They can easily be aligned. There are few technological wonders of our era that are more appreciated than modern braces. Teeth straightening hardware of past generations in Provo had many drawbacks. It often involved a whole orthodontic tool kit – full metal bands, headgear, elastics, spacers, and wires poking every which way. If you played an instrument that required the use of your mouth, well, it wasn’t pretty. 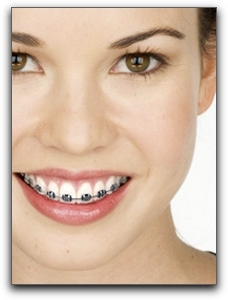 Some Utah County orthodontic patients found their conventional braces uncomfortable, bulky, and downright ugly. They also created many hidden nooks and crannies for bacteria to quietly drill into your enamel. If you are too young to remember old school braces, you can’t truly appreciate the technologically-advanced ceramic braces, clear braces and Invisalign aligners available today right here in American Fork, Lehi, and Utah County. Even conventional metal braces are now smaller, less noticeable, and more comfortable. The advancements in Provo orthodontic treatments and shortened treatment times is one reason many Orem adults have chosen to straighten their teeth even if they passed as a teenager. Does that mean you don’t need to have your child seen by a Provo orthodontist if you suspect problems? Absolutely not. The American Association of Orthodontics recommends early Orem orthodontic evaluation. It is always best to identify troubles with teeth and jaw development early. 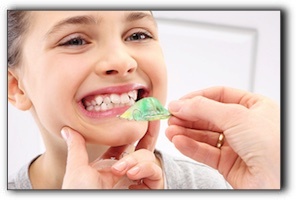 Your orthodontist or pediatric dentist will know the proper age to begin treatment if needed. We provide many cosmetic dental procedures at Hammond Aesthetic & General Dentistry in Provo. Did you know that Utah County porcelain veneers can solve some less-extreme tooth alignment troubles? If your teeth are fairly straight but your smile is compromised by a couple of damaged or chipped teeth, affordable porcelain veneers may be your one-visit solution. For more information about the cosmetic dental options offered at Hammond Aesthetic & General Dentistry in , see https://www.cosmeticdentistryutahcounty.com/about-us/ or call 801-374-0070. Are you an adult in Orem with misaligned teeth? Do you regret not having orthodontic treatment when you were a teen? It’s not too late to straighten your teeth – and there are more types of braces available than ever before. Perhaps you are not familiar with the latest types of braces. Here is a quick rundown of the most common types used in Orem, Utah County and Provo cosmetic dental practices. Invisalign, Damon, and iBraces, are some of the trade names of proprietary orthodontic systems used in the Utah dental community. 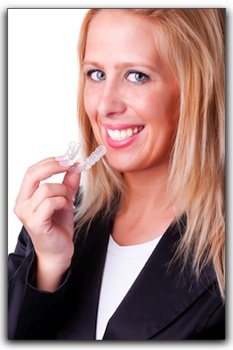 Clear retainers are also popular with Provo orthodontists and their patients. They fit the teeth like a transparent glove without the need for hardware. Some Orem patients believe clear retainers are more comfortable than other types. If you want more beautiful teeth, come into Hammond Aesthetic & General Dentistry in Provo and discuss your goals with Dr. Hammond, DDS. Hammond will examine your teeth and recommend the most effective system for you. Hammond Aesthetic & General Dentistry is a full-service general, family, and cosmetic dental practice. We have been exceeding expectations since 1967. Ask us about cosmetic dentistry, sedation dentistry, and porcelain veneers. Many Provo adults dream of having a celebrity smile, but for some, the thought of enduring months or years with a mouth full of metal thwarts those dreams. If you live in the Provo area and don’t want to sport old-school metal braces, we are happy to report that there is a better way. There are now contemporary, metal-free approaches to straightening crooked teeth. Custom invisible braces that are worn over teeth are now available in Provo. When you smile, nobody in Provo will know that your teeth are slowly and gently being corrected. The busy lifestyle you lead in the 84604 zip code area will not be hampered because invisible braces are so simple and convenient. The comfortable aligners allow you to eat anything you want and caring for your teeth will not become cumbersome. Provo neighbors will notice your confidence and poise blossoming as your teeth are aligning. At Hammond Aesthetic & General Dentistry we have been creating alluring and appealing smiles in Utah since 1967. We specialize in complete smile makeovers. A popular procedure that many Utah cosmetic dentistry patients depend on is teeth whitening in Provo. We offer many options including methods you can do at home. Some of the most popular treatments at Hammond Aesthetic & General Dentistry include cosmetic dentistry, sedation dentistry, and dental implants. Whatever your dental needs are, we will create a personalized, custom treatment plan for you.